If you have been following along, you are familiar with the progression of our main floor bathroom which has primarily been made over with paint. It started with adding some shiplap, then painting the laminate vanity, followed by stenciling the laminate flooring. With each update I fell more and more in love with this room and the time and energy spent have been so worth it! It has slowly transformed into my most favourite room in our home. Seriously! So next on my to do list for this bathroom was to tackle the tub and tile in the shower. It was a cream colour that looked so dated and dingy next to the white shiplap. It stood out like a sore thumb after replacing the toilet and sink and the decorative tiles had to go! BUT we were not prepared to gut it or to even consider a bath fitter situation so I started researching the Rustoleum Tub and TIle Refinishing kit. For under $60 I could transform my shower so I decided to go for it. Gross right?! Ugh, it's a bit embarrassing sharing these. Even after cleaning well, the tile grout was stained with mildew and the tub, well it's seen better days. I read the instructions with the kit and also several online reviews for people who had used the kit and had a positive experience with it. It didn't seem too challenging but everyone stressed the importance of cleaning and preparing the surface well and provided strong warnings about the strong chemical fumes. I followed the directions and cleaned the tub and tile using bleach water. I wiped everything down with this and a rag and then rinsed with water. I then used comet and a sponge and scrubbed well, rinsing with water. I finished by using the CLR bathroom and kitchen cleaner to remove lime scale, scrubbed with a sponge, wiped with a rag and rinsed with water. I then left it to dry for over an hour. The kit says to remove any caulking beforehand. I tried by best to remove the caulking with an exacto knife but it didn't come off easily and after a half hour I got pretty fed up and figured I had removed the majority of it. Then I used my painters tape to tape everything off which I didn't want painted, I did not remove anything like the faucet, drain, shower head, etc. I did remove the grab bar and didn't replace it. .
My next step is one you may want to avoid as this is where things might have gone wrong. According to the kit's directions, the next step would be to sand with 400-600 grit sandpaper in order to remove shine and ensure the paint can adhere to the surface. My tiles and tub were far from shiny so rather than sand I decided to apply primer instead. While researching use of this kit, I came across a tutorial in which the person had primed prior to using the epoxy mixture. In my mind I thought priming would help with the adhesion. Also, when I had painted my kitchen backsplash tiles I cleaned the surface well and then primed prior to painting with an oil based paint and sealed with polycrylic. This process has held up incredibly well but given that this is a tub and tiles that will constantly be exposed to water, moisture, humidity, etc I knew the process for the kitchen wouldn't be the same and thought that's why it requires the epoxy. Truthfully, I didn't know much about epoxy as this was my first experience with it so I thought priming would be a helpful step. In retrospect, I would not do this again. Honestly, I cannot say that this was necessarily what caused the problems but it is not in the directions so it is probably safe to assume this affected the process. So, now my tub and tile had been cleaned and primed. I waited about 2 hours for the primer to dry and then continued with the kit. I made sure I had the exhaust fan on as well as a oscillating fan blowing to help with the fumes as it is beyond stinky! Remember your gloves, respirator and goggles. The directions state that you mix equal parts of the base with the activator. Now the trouble I ran into was that all of the tutorials I read online were likely US based and the US kit provides a larger base can that appears about half full and allows room for you to pour the activator in. The Canadian kit is two small cans so they need to be mixed in a separate container. The kit explained the importance of mixing the two equally and also stresses that you only mix the amount you will need as you can only use the mixed product within 6 hours from mixing. Unsure how long this would take I decided to mix half each can together. I did so in a red solo cup. BIG MISTAKE. Again, not being familiar with epoxy, I didn't realize the strength of the chemical and that it would literally eat through the plastic cup. I didn't notice this until I was dripping pink residue everywhere. I went ahead applying the first coat which was quite thick and sticky. I applied it mostly with a bristle brush in order to get in between the tiles and grout lines. After the first coat, many of the decorative tiles were still visible. I left it to dry for an hour as stated in the directions. I mixed the remaining base with the activator in the cans as they were only half full so now allowed for room to mix. This time the consistency was very thin and when applying to the tub it appeared almost translucent. I was immediately concerned as the first and second coat appeared so different. The second coat did not appear to be applying any additional coverage so I started to worry, knowing that I would now need to purchase a second kit. I was bummed as this would immediately double my cost of the project. So I let this dry overnight with the exhaust and fan running and the door shut. When I entered the bathroom the next day I was super disappointed to determine that the surface was not drying. It was quite sticky and tacky to the touch. I was instantly concerned as the directions state it should feel dry to the touch within an hour but you leave it for 24 hours before applying a third coat and then let it cure for three days. I went ahead and purchased another kit and while at Home Depot I explained my situation to a sales associate. He informed me that he hates two part epoxies for this exact reason. He encouraged me to leave it alone and see if it dries as applying another coat at this point with only make more of a mess and the current sticky parts will never dry. So I listened and let it sit for 72 hours. Every once in awhile I would check and see if it was drying and each time was super disappointed to find that it was still tacky and leaving noticeable finger prints in many spots. Some of it had hardened but at this point I was panicking. Remember I said when I said it was not in the budget to retile and replace the tub or pursue bath fitter? Well it still wasn't in the budget especially after spending $130 on product. So then I started researching what to do with epoxy if it isn't curing. I had a heck of a time coming up with results at first. Although there were lots of negative reviews I was finding for the refinishing kit, no one was talking about a solution. Panic continued to settle in, I even woke up in the middle of the night and spent about 2 hours on my phone researching how to fix my mess. I then came across suggestions to use a plastic scraper to remove the wet/sticky material and then apply acetone to it which dissolves two part epoxies, This gave me a little bit of hope. So I returned to Home Depot and grabbed myself a bottle. Again, this is a chemical solvent and should only be used with gloves, a respirator, goggles and ventilation. I went at the sticky areas with the plastic scraper but this didn't do much so I applied some acetone to it to dissolve it slightly and then scrape. Well it certainly works at dissolving and you have to be careful with it as I was starting to make a mess with what it was dissolving and how to properly wipe it up. Don't use paper towels as this will get stuck in any of the sticky residue, use a rag and throw out after. Also, ensure you area is prepped well with a drop cloth, I didn't take this precaution and unfortunately managed to drip some of the acetone on my painted floor. The acetone worked fast and soon I was down to the original floor of the bath tub which seemed to be the area that wasn't curing at all. I scraped what I could and for the areas that were only mildly sticky, I wiped them gently with the rag with a bit of acetone to try and remove the sticky-ness. Then I let it sit overnight. I came back in the morning and for the first time since starting the project, I was finally feeling better and hopeful that I could now apply the kit again and pray it would cure. I used a handheld plastic container meant for paint and mixed both cans completely together in it. I definitely think this made a difference immediately as it was likely a more appropriate mixing ratio. I still blame Rustoleum for suggesting that you don't mix both cans together at once but only encourage equal ratios. This was definitely a misstep with my first try. I applied the mixture to the bare areas first using a foam brush. Then I used a combo of a bristle brush and foam roller to all of the tiles and the tub. I was so relieved that it appeared to be covering all of the decorative tiles and everywhere was looking bright and shiny. I applied a second coat to the areas that had been scraped and cleaned with acetone and it was finally starting to appear that the coverage was even. I had about half of the mixture left when I let everything dry. Again it says not to wait more than 6 hours to use after mixing but the first coat also didn't appear dry after the first hour so I decided to leave it. I was content with the coverage if I wasn't able to use the rest of the product within the 6 hour time frame. Also, I am not sure if it was the mixture of the acetone with the epoxy or if I was just more sensitive to it, but I had to leave the bathroom on several occasions this time around as I started to feel incredibly dizzy. I went outside for fresh air and opened all the windows in the upstairs to allow for a cross breeze and additional ventilation. It took quite awhile to feel better and it left me with a pretty nasty fume headache. Please be careful when using these types of products, make sure you take the proper precautions and breaks as needed! This bathroom is directly beside our two spare bedrooms, thankfully our bedroom is on a different floor. I am thankful to have completed this project now as it is not something I would ever consider if I had children in the home and I also made sure my dog wasn't near it. I let this dry for several hours and practically cried when I did a touch test and it WASN'T sticky!!! FINALLY!!!!! There were a few small, slightly sticky areas but I knew I would be leaving it alone for at least 3 days so I crossed my fingers. I ended up leaving the tub and tile for about 5 days before having a shower in it. Again, it isn't perfect. There are a few areas that appear to have bubbled since being exposed to water and heat. Nothing seems to be peeling yet, we will see what happens when I have a bath. But it looks much better than it did even if it is only a short term fix! I finished it by applying fresh caulk around the tub where it meets the tile and along the front of the tub where it meets the floor. I also added some caulking in the holes left from the grab bar. I almost cried when I removed the painters tape after caulking and some of the paint from the tub peeled off. Seriously?!?! I didn't know how to fix it given that I had thrown the remaining amount of the epoxy mixture out days ago. I decided to chance it and applied some ultra white semi gloss paint to it and it seems to have done the trick!! After- the finished product :) :) :) plus a new shower head ! 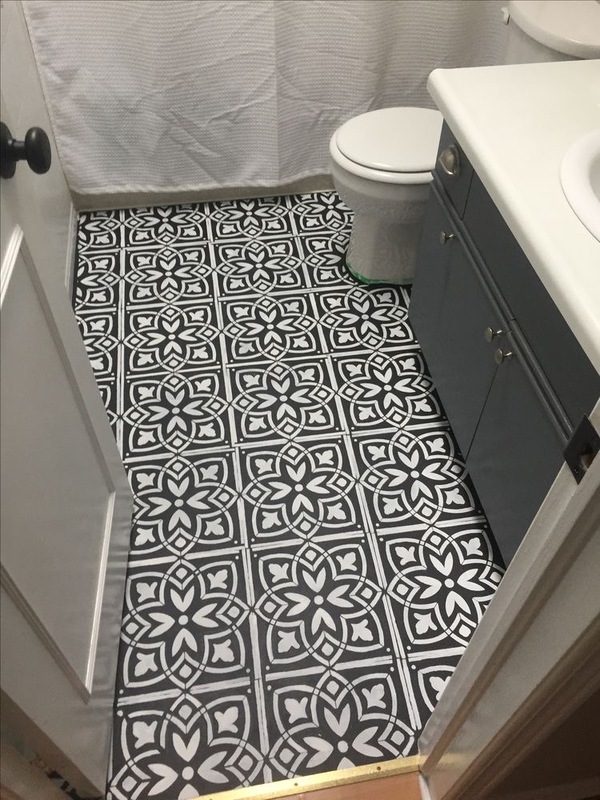 When I finally felt that this project was almost complete, I decided to try to fix my floor where I dropped acetone and ultimately decided to repaint and stencil it. In my original post on this project I mentioned how when applying the polycrylic, it pulled some old paint from the brush across several of the "tiles". I also didn't properly space the stencil the first time around so I decided I could quickly redo it. It took me two evenings and I followed the same process as I did the first time. The only thing I did different was I started in the corner against the tub so that I wasn't bending the stencil against the tub and the entire wall and I also spaced it properly. It still isn't perfect as no stencil is but I am much happier with it! One project always turns into another. So there you have it. For those of you who hung in there and read the whole thing, good work!! heehee. This definitely wasn't the easiest project I have ever completed but looking at the BEFORE and AFTER pictures makes it all worth it !! Happy Valentines Day, friends!! Today is also the two year anniversary of launching my blog, The Penny Drawer!! Time flies when you are having fun :) I want to thank my friends, family and readers for continuing to support me and my blog and providing honest and positive feedback, it is so appreciated!! I have said it before, I am not the most consistent blogger and rather than set goals I may not be able to maintain, this year I am striving to drop the guilt and the comparison I sometimes feel as a blogger. In an ideal world I would love to have a few scheduled blog posts each week/month in addition to posting regularly on Instagram. I do admit that I often find myself comparing my projects and my photos to others and although I do find lots of inspiration from the people I follow, I am learning not to make myself feel bad, guilty or upset if I am not at the same level or consistency. I work full time at a community mental health agency in additional to a casual position with a crisis service. My job can be difficult and challenging and I started my blog as a creative outlet from my “real job”. But working 6 sometimes 7 days a week, I don’t always have the time I would like to spend on DIY projects and home decor. With that being said, I go through phases where I am working on multiple projects at once and then don’t do anything for a period of time. It's called balance and something I preach on a daily basis to the individuals I am supporting so it only makes sense that I practice it in my personal life as well. I also find winter especially challenging to take good home photos given the lack of natural light. I can only imagine how challenging it will be to maintain a blog and social media presence once we have a family, but I am so excited for that chapter to start and to share it with you!! Anyways, I don’t want to make excuses I just want to provide some insight and also take some of the weight I feel off of my shoulders :) I really love having the opportunity to share my projects and decor with you!! I am really proud of what I did accomplish in the last year; helping plan and decorate my sister’s wedding, stencilling my bathroom and kitchen floor, multiple wood projects including floating shelves, picture ledges, painting numerous pieces of furniture and my biggest project was our laundry room makeover. Not too shabby! As mentioned in last month’s post, 2018 is wedding year so I am putting home projects on hold to a certain extent in order to focus on wedding planning and decor.I do have a few home projects on my TO DO that I hope to accomplish prior to being in the deep of wedding planning. I am so excited to share some of my planning and progress with you soon!! Hello friends and happy New Year!! I think I’m still allowed to say that, right?! I hope everyone had a great holiday season and start to 2018!! I came down with a nasty cold after the holidays so my new year motivation and to do list took a major hit. I spent lots of time on the couch resting and as always, spent way too much time on Pinterest and made tons of plans and goals for myself, my home and our wedding. 2018 is wedding year!! We are saying “I Do” on October 13th and although it seems very far away, I know the next 9 months are going to fly by. In addition to our wedding we also have our stag and doe in May as well as bridal showers, bachelor and bachelorette parties along with other friends’ weddings. We are both standing up in our friends’ wedding in August so times all wedding stuff by two and that will be how we spend our spring, summer and fall. We are so excited for the coming months and all the fun it will bring!! Currently, I am working on updating our wedding planner timeline and determining what we need to do and when. We were able to get a ton done shortly after our engagement in terms of booking and paying initial deposits. I am planning and decorating the entire wedding so I have my work cut out for me but thankfully I am an organized person and I have been enjoying each step of the process thus far. This time last year, we were in the midst of wedding planning and DIY decorating for my sister’s February wedding. This was obviously a much shorter time frame and I think we pulled it off beautifully with little to no stress. After my sister’s wedding I thought “Hey, maybe I should be a wedding planner” and thankfully we got engaged not too long after so I get to try my hand at it again :). I also want to take advantage of some weekends I have off of work over the winter and tackle some stuff around the house. I went ahead and finally painted our basement TV room this past weekend. It is the only room in our house I haven’t really touched so I am so happy to have given it a bit of a facelift. It still requires lots of attention as it includes some pretty ugly, mismatched furniture that is not in the budget to replace just yet. I also have plans for making over the fireplace as well as I have a 14ft beam also scored at the barn prior to being demolished. Other home plans include refinishing our upstairs bathroom tub and tile using the Rustoleum refinishing kit so I will let you know how that goes!! I am super excited to imagine a bright white shower instead of the current cream coloured tub and surround with floral decorative tiles (YUCK). I started my spring cleaning early this year and have been trying my best to declutter and organize our home, especially closets and storage spaces I have dropped off a few car loads if donations to Goodwill and it feels so great to start the year off fresh! So those are some of my plans for 2018, what plans or goals have you made?